When it comes to advertising, having an ad campaign that visually captures the focus of an audience are always successful. They’re engaging, interactive and compel the thought process of the entire audience to get them checking out the brand. A successful ad could be very simple and if done correctly, will have a significant positive effect on how well your brand does. 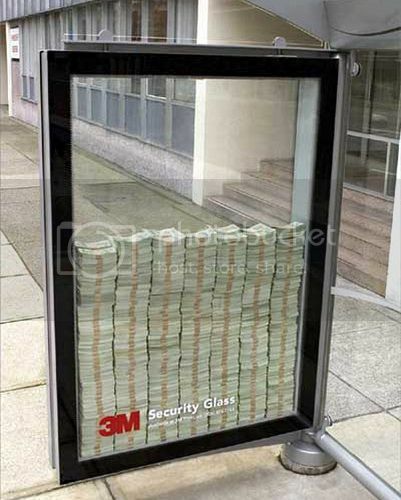 Such was the instance when 3M decided to place money ($3 million with only $500 real currency) inside their security glass at a bus stop. The catch was people could keep the money if they could break the class using only their feet. No special tools or equipment were allowed as there was a security guard on site making sure that nobody cheated in order to get through the glass. That kind of advertisement is designed to catch the eye of the audience, have them engage and interact and at the end of the day talk about the brand. It’s word of mouth in the highest form because it generates from a campaign that was simple, but VERY effective. To have individuals attempting to break a glass to get a reward and failing, thus showing the strength of the glass, shows the strength of the campaign itself.